George Washington's position in history is very secure as one of the founders of the American experiment and the first US President. As was the early practice Washington was elected by the congress rather than by a popular vote. There was no "White House" in 1789 and Washington was actually inaugurated on Wall Street, New York on the balcony of Federal Hall. He took the first US presidential oath of office on April 30, 1789. Noting the significance of the first actions of the first US President, Washington wrote to James Madison, his friend and the man who would become the fourth US president, "it is devoutly wished on my part, that these precedents may be fixed on true principles." George Washington was born in 1732. His was a family of Virginia planters and young George was raised as an 18th century Virginia gentleman. His two passionate interests were the military arts and western expansion. At age sixteen Washington helped survey the lands of the Shenandoah area in Virginia working for Lord Fairfax. A a lieutenant colonel in 1754, Washington fought in the first small battles of what would soon become the French and Indian War. A notable narrow escape to the young soldier as an aide to General Braddock when Washington had two horses shot out from under him as he rode. For some 16 years before the beginning of the American Revolution, Washington managed the lands of his large estate at Mount Vernon and served in the Virginia House of Burgesses. Like some of the other landed elite of the time, Washington felt exploited by the British both in terms of relations to merchants and commercial regulations. These conflicts would lead to war. In 1775, when the Second Continental Congress assembled in Philadelphia, Washington would be elected Commander in Chief of the fledgling "Continental Army". He would hold that title for the next six years. The general superiority in number and training of the British forces led Washington to conclude that that small skirmishes and guerilla style actions would be more effective than large battles. He reported to Congress, "we should on all Occasions avoid a general Action, or put anything to the Risque, unless compelled by a necessity, into which we ought never to be drawn." Some historians believe that without the participation of the French, who entered the war partly after the urging of Benjamin Franklin, the British would have quelled the US rebellion. But the French came to the aid of the US and in 1781 Washington forced the surrender of Cornwallis at Yorktown, effectively ending the Revolutionary War. The American experiment would soon blossom. Washington expressed great interest in retiring to his Mount Vernon estate after the war. 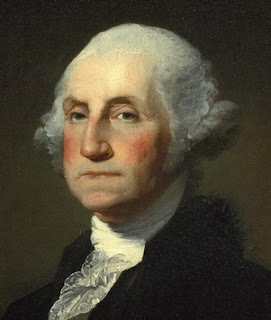 However his concerns about the early challenges of the United States and a strong lobby to draft him to become the first president motivated Washington as a participant in the Constitutional Convention in Philadelphia, 1787. After the new Constitution was ratified the Electoral College unanimously elected Washington as the first President of the United States. A key early foreign policy decision by Washington was that of neutrality during the war between France and England near the time of the French Revolution. This decision frustrated Thomas Jefferson, the first Secretary of State, who was very much in favor of helping the French. Some believe Washington's motivation was to let the new country grow stronger before committing to such a major international enterprise. Washington retired at the end of his second term, unhappy to see how the emerging "two party" system might polarize debate unnecessarily. In his Farewell Address Washington warned against the perils of excessive party spirit and geographical distinctions while his parting advice for foreign affairs was to warn against long-term alliances. On December 14th, 1799, after less than three final years at Mount Vernon, George Washington died. The cause was a throat infection. The life and career of one of the most remarkable historical figures of all time had come to an end, but the country Washington helped found - and arguably would not exist without his efforts - would grow and prosper for centuries to come. Credit to the US White House Website for biographical information.